SRM Institute of Science and Technology motivates its academic fraternity by promoting basic and advanced research activities for technological development. Numerous workshops on Patenting and Innovation Management are being conducted every year in the university. These workshops educate the teaching faculty, research scholars and students about the critical skills needed to identify novelty in their projects, research works for possible patenting. So far, SRMIST has 10 granted patents, 50+ patents published and 170+ patents filed to its credit. SRMIST has a well-defined IP policy which promotes the faculty members, students and inventors to consider possible avenues for transforming their inventions into products beneficial to the society on a grand scale. The institute offers a common platform wherein the inventors get an opportunity to interact with the potential investors or industries for commercializing their patents. The institute takes every measure to protect and manage the research inventions of its staff and helps them to effectively utilize their invention by using an efficient IP system. The institute will pioneer the setting up of a successful industry-institute collaboration model which would benefit all the stakeholders in commercialising invention and mass producing them for public use. 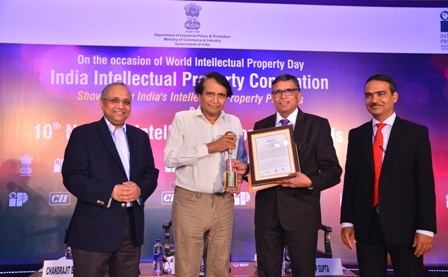 Based on the outstanding contributions of SRMIST to Intellectual Property in the country, the Intellectual Property Office, India under the Department of Industrial Policy & Promotion of Ministry of Commerce & Industry, Government of India selected SRMIST for the most prestigious National Intellectual Property Award 2018 in the category of "Top Indian Academic institution for Patents & Commercialization” in recognition of significant achievements of SRMIST in the field of Patents. This Award was received by the Honorable Vice Chancellor Prof. Sandeep Sancheti, SRM Institute of Science and Technology from Mr. Suresh Prabhu, Hon’ble Minister of Commerce and Industry, Govt. of India at the felicitation ceremony on 26 April 2018 at New Delhi. Musical Tour of the world!